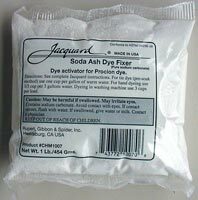 Soda Ash dye fixer is a mild alkali that promotes the chemical reaction between and cellulose fiber. It is also known as sodium carbonate, washing soda or sal soda. Soda Ash is necessary to activate and set Procion MX dye. There are about 1 1/2 cups of soda ash per pound. If you are dying in the washing machine you will use between 2 and 3 cups of soda ash per load. If you are tub or immersion dying you will use between 1/4 and 1/3 cup of soda ash per 3 gallons of water. If you are tie-dying using squeeze bottles you will use 1 Cup of soda ash per gallon of water as a pre-soak.